[Born 2011, Departed 2013] Wow, the web certainly is buzzing with news that late night funny man Jimmy Fallon now has his very own flavor! As other articles have pointed out, he is in a very small group that includes Willie Nelson, Elton John, and Stephen Colbert. Thing is, all the news tends to focus on the news itself, and even though there was ice cream at the press conference, at best it's one line in a set of a few paragraphs. That seems wrong to me, but I'm not a professional, I'm just a guy with a spoon. So, I've decided to cover Jimmy's new flavor in two ways. This first post will be my attempt at being professional. Stick to the facts, review the flavor, and post it tonight. There is going to be a second post that will be much more personal and basically cover an average man's journey to his very first press conference. I hope you enjoy both stories. Now, let's get to that ice cream!! So here's the official photo that's been flying around. 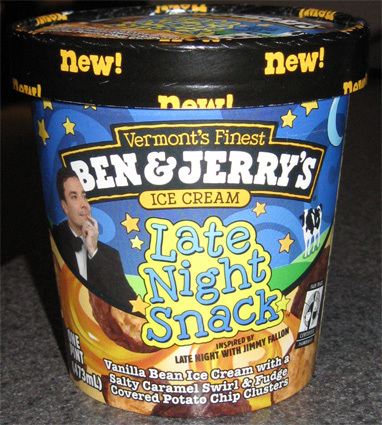 Now it doesn't actually say Jimmy Fallon, but you can see him on the label, and the treat is Late Night Snack which I'm sure he hopes you'll eat while watching his Late Night Show. (official photo got taken down, above is my own shot taken later on). It's Vanilla Bean Ice Cream (not just vanilla) with a Salty Caramel Swirl & Fudge Covered Potato Chip Clusters. Now I actually tried the flavor twice last night at the press event.... What? You thought one little cup would be a worthy review? I think not!! I saw one or two others grab a second cup. Heck, I would have went for a third helping but I thought all the professionals around me might start to wonder. The good news is that I got two good moments with the ice cream, and they both left me feeling the same way: THIRSTY! Ok, I grabbed my first sample and went straight for the fudge covered potato chip clusters. Being a giant fan of all sorts of chocolate covered crunchiness, these did not disappoint. To be honest, I would have loved a little grab bag of these things to try by themselves. Once I had 3 or 4 clusters, the potato chip taste was pretty much stuck in my tastebuds for the remainder of the sampling. I felt like I was eating potato chip ice cream, and this was a little weird for me. Think about it, when you eat chips, their taste lingers, that's the beauty of chips. Growing up as a kid, we had sandwiches all the time and to keep things fresh, you take a bite of sandwich, have a chip, bite of sandwich, take a chip, maybe two bites then two chips. That's what is happening here. The chips do this great job of infiltrating the whole treat. Hmmm, sure hope you like chips! Now at this point we had a problem: I'm thirsty! The chip taste is also the after taste and there were no beverages in sight. I would have wandered off to find a coke machine but the nbc studio chaperones would have none of that (understandbly so ofcourse!). We had to wait for the show to finish taping and the studio audience to leave, so we basically just hung out for a bit. Man, I'm really bummin' that there's no drinks. Well, I have to do something, I think it's time for sample number two. I wander up and ask if I can have another, and they say ofcourse! If I had a bowl with me, I would have had them fill that up in a heartbeat. Since I started my first sample with the clusters, I decided to head for the base ice cream first this time. "Shockingly", it's really good. The base and the caramel swirl come together really nicely and I'm reminded of the awesomeness that is Haagen-Dazs Fleur de Sel Caramel. Mmmmm, I could eat the base all by itself. I dig into a few clusters and my second sample is gone.... and I'm thirsty again! I usually don't have a drink with my ice cream, but this one is going to be an exception to that rule. So it's not love at first bite?? Honestly? Not for me, but don't worry. I love cookies n' cream, so it was easy to be instantly in love with Milk & Cookies. Late Night Snack is just so different that my taste buds need time to adjust. That's not a bad thing, but it is the truth. Ben & Jerry's has really brought something unique to the mainstream market and it has set the bar pretty high for 2011. When it comes out, make sure you grab a pint, I know I will. For a second opinion, check out Rodzilla's very positive review of Late Night Snack. So true about chips (and, may I add, also donuts.) that's why I've never thought of chips as "bad" for you - it's the kind of taste that satiates and makes you mentally full. I'd love to try this but have no seen it in stores. I did however try B&J for the first time in my entire life just the other day. I ate one of the little Cookie Dough containers side by side with a half pint on my beloved Aggie Cookie Dough just to see if I could taste a difference. i lvoe hearing about new flavors, especially B&J. Not really sure about the saltyness of ice cream, as I wasn't a fan of the fleur de sel Haagen Daaz flavor, and I've tried chocolate covered potato chips but wasn't crazy about them. But this is Ben and Jerry's ... so if I see it I'm buying it. thanks for the heads up. we bought every.single.new B&J flavour we could get our hands on today(blueberry cheesecake, carrot cake, red velvet cake, clusterfluff, late night snack, bonnaroo buzz). I was most excited for the late night one, but honestly - it was my least favourite. I found it kind of bland. Clusterfluff was very similar to Chubby Hubby(always a good thing). bonnaroo buzz, clusterfluff, and blueberry cheesecake were my favourites. I wonder what dictates the distribution pattern... weird! and my condolences! I liked this one way more than Clusterfluff..the way the clean sweet vanilla bean mixes with the salty caramel swirl. The potato chip clusters hits any PMS craving! For me this was a 9 out of 10!! Gigi - Go out and look again! We FINALLY found it today at Publix! !